6/6-11 ~ "Let the Moon Lead the Way"
Note: For those living in San Francisco this New Moon takes place overhead. The Sun, New Moon and planets are located in the same constellations for other parts of the world; these constellations, in differing time zones, lie in a different location above or below the horizon. June 1, Wednesday, the Moon passes between the Sun and Earth and partially eclipses (hides) the Sun for observers in high Northern Hemisphere latitudes: Siberia, northern China, remote parts of Alaska and Canada, and Iceland. Click A Rare Eclipse of the Midnight Sun and Animated Eclipse to learn more. This first eclipse is possibly the most beneficent of the three. It emphasizes refining a bridge between mental clarity and intuition. Learn to listen to the shifting winds without distraction. ... open to new ideas, communicating and networking. There may be a difficulty setting priorities with short-term vs long-term goals and visions. Multiple identities vie for manifestation. Scattered excitement or fatigue are potential extreme directions. Attunement to your personal rhythms and the rhythms of the earth harmonize your pace. It's not about pushing and getting nowhere frazzled and fast. There is wisdom in timing and listening. Take nothing for granted, question certainty, explore possibilities, invoke persistent gratitude. ... The gift is recognizing what we know to be true and articulating what is essential. Seek your fertile ground. A Solar Eclipse changes the way we perceive the order of our lives. ... This partial eclipse may mark significant endings and beginnings. How am I holding up mentally and physically to the stresses in my life? How may I pace myself? Am I receptive to listen and willing to change? The Goodwill Festival, the last of the Three Major Planetary Spiritual Festivals, is celebrated globally at the Full Moon occurring during Gemini. At this time the will-to-good is released into human consciousness; its potency affects the nations of the world through the New Group of World Servers. As a result, humanity is brought closer to Shamballa. See Significance of the Goodwill Festival. The Sun and Moon embrace in the constellation Taurus the Bull. The enlightened mind is the gift of Taurus when one transforms desire into spiritual aspiration. A desire that has no concern for the goodwill of others can reek havoc and violence on Earth. Attachment to our desires and to a specific manifestation of them imprisons us in a limited, fearful and selfish world. Taurus at its highest brings us spiritual illumination and a larger, more inclusive view of the world. The Sun and Moon are in conjunction with Aldebaran (eye of the Bull) and both enliven the Aldebaran / Antares Axis. Antares located in the constellation Scorpius, lies directly opposite in the zodiacal wheel. Aldebaran is truly a bull’s eye, a star of enlightenment. It holds a vision that is seeded by the Pleiades (shoulder of the Bull). Constellation Image It is a divine ideal that can aid humanity’s evolutionary process through its political systems. Antares insures that the visions of humanity are in alignment with this ideal. Note: Each year the Goodwill New Moon or young Crescent Moon awakens illuminating Aldebaran and its divine ideal within humanity, while the Goodwill Full or almost Full Moon activates rebellious Antares ensuring our growth, evolution and change. Sidereal Taurus is the primogeniture of the zodiak, the Earth sign from which life springs. Aldebaran holds the vision for global leaders and world servers inspiring the administrative planning of world affairs, specifically for physical logistics and a global infrastructure designed to support humanity through evolutionary growth and change. Mercury messenger of the gods conjoins the Pleiades star cluster. Review map above. This planet supports the visionary mission of the Pleiades by linking us to the soul and inspiring the mind with divine tidings. Listen. Messages of light are being sent our way. In the Christian calendar Ascension Day occurs on a Thursday the fortieth day after Easter. It commemorates the bodily Ascension of Christ into heaven. In 2011 this Feast is celebrated June 2, the day after the Goodwill New Moon. It is interesting to note that at the Goodwill Full Moon the Christ releases to humanity the potent energies which He received at the time of the May 17, 2011 Wesak Full Moon Festival. With the keynotes of goodwill and "humanity, aspiring to God," the Goodwill Full Moon Festival is also observed as the Christ Festival. The Christ consciousness and Ascension are at the forefront of this lunar cycle. Participate in the Global Ascension Meditation anytime. Call forth your personal ascension on the summer solstice. The New Moon inaugurates a goodwill cycle that affects the nations of the world through its world servers. Positioned in the constellation of Taurus the Bull humankind can begin transforming desire into spiritual aspiration and the willingness to do good in one's world. The enlivened Aldebaran / Antares Axis insures the distribution of this healing, evolutionary energy into the political systems of our planet. This lunar cycle is bridging mental clarity and intuition. We are reminded that open mindedness, the search for truth and receptivity to Divine messages can provide guidance, as upheavals ensue and the order of our lives changes. In preparation for the Goodwill Festival the heavens are seeding our vision and in turn enlightening our behavior for spiritually infused leadership on a global and personal level. Hmmm ... it reminds me of the ancient ritual of the Pentecost with its creation / ordination of Divine messengers. "Go forth into life to serve, to uplift, to heal, to comfort." BTW: In 2011 the Pentecost is celebrated Sunday, June 12, three days before the June 15 Goodwill Festival Full Moon. Full Moon during Gemini begins with this New Moon. Young Luna enlivens the Gemini Twins sole to soul, as her Crescent shape waxes in the west during the first weekend of June. Get out those binoculars for an extra treat! Note: At the end of May and in June the Gemini Twins, representing the soul and personality, can be seen united, standing tall on the western horizon at sunset. It is interesting that this is also the time of graduations and marriages. (Each year at the beginning of January, the Gemini Twins can be seen rising feet first above the eastern horizon at sunset.). Generate these for your area. The following is culled and excerpted from: Alice Baileys Esoteric Astrology pgs. 343355. Helpful links have been added. Gemini keeps the interplay of energies between dualities active and flowing so that eventually they reach synthesis and unity. Gemini is "the constellation of the resolution of duality into a fluid synthesis". Gemini forms a triangle with each pair of opposing constellations ... the 12 constellations can then synthesize and become the 6. Gemini is the entrance for the energy of Sirius. The Love of Deity (2nd Ray) pours through Gemini into our solar system. The Cosmic Christ appears on the golden triangle formed by Gemini (the head), the Great Bear (one foot) and the Pleiades (the other foot). Hearing the cry of the Mother (Virgo), the Seeker (Sagittarius) and the submerged fish (Pisces) the golden triangle morphs into the Mutable Cross. The constellation Gemini along with its ruling planets and the Great Lodge are responsible for setting up the necessary stimulation and magnetic fields between the animal and spiritual kingdoms that produced individualization and the human kingdom. That's why the Full Moon Festival during Gemini is so uniquely linked to humanity and spiritual aspiration. Amazing food for thought! Both Mercury and Venus are rulers of Gemini. Mercury (exoteric ruler) conditions the personality life and creates Divine messengers. Its emanations first stimulate the concrete mind to distinguish between the self and not self. They then illuminate the higher mind creating a link between the Soul and the personality. The emanations of Venus (esoteric ruler) helps one begin to understand the causes and conditions of harmony and conflict and thereby lovingly and wisely link the lower mind to the higher mind. Emanations of cooperation, unity as well as a divine sense of the Whole are being focused through the constellation Gemini, and are potently impressing humanity during Gemini! Tune to the cooperative Gemini Twins. Though opposites, representing the form (Castor) and spirit (Pollux), they innately work together for the benefit of the whole. United they are and do something greater than either can alone. Imagine humankind within every nation uniting to express the potential that benefits all! Note: The dated circles represent the approximate position of the Moon on the given night. The location of the exact Full Moon (not shown on the map) is above the stinger of Scorpius, a little right (west) of the 6/15 dated circle. This location marks the Galactic Center (GC). The sweeping J-shape of Scorpius journeys along the southern horizon from east to west, and directly behind it follows the teapot-shaped asterism of Sagittarius and telescopic Pluto. By 11:30pm the sprawling "J" shape of the cosmic Scorpion fully rises in the southeast. Vary the All-Sky Chart for any date and time. At 12:30am Scorpius lies directly south and by 3:30am it is setting in the west. 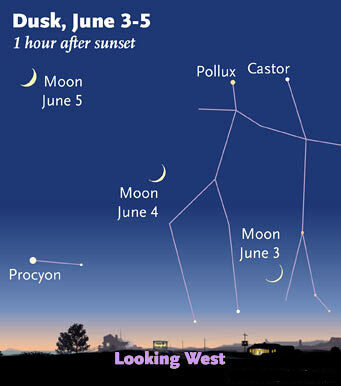 Note: The light of Moon may interfere with observing the constellation shapes. Sagittarius, a centaur archer, points his arrow at both Antares, the red heart star of Scorpius and also at the Galactic Center (GC), the Heart of our Milky Way Galaxy, the family of 200 billion stars to which we and our Sun belong. The Milky Way is widest in Sagittarius and Scorpius because the great bulging central hub of our galaxy is in this direction. This lengthy Goodwill Festival eclipse portends that it is a strong material focus / desire, which is interrupting the flow of goodwill in our lives. In addition, this Full Moon eclipse occurring during the sign of Gemini is illuminated by the Sun positioned near the star Al Hecka, the southern horn tip of Taurus the Bull; Mercury is in conjunction with both the Sun and this star. Al Hecka is about habitual fighting that leads to stalemates, standoffs and brick walls, especially old battles of a religious nature. Mercury is a divine messenger who inspires the mind, leading us to the soul and the breakdown of outdated patterns of behavior. Gemini keeps the interplay of energies between dualities active and flowing so that eventually they reach synthesis and unity. Gemini's emanations, the healing of the nations and humankind's evolution require that opposing energies keep interacting until co-operation achieved. June 15, Wednesday, the Full Moon is exact at 1:14pm PDT (20:14 UT). The Festival of the Goodwill Full Moon is significant in that it brings an abundant tide of love for humanity to use as goodwill in establishing rightful world conditions. It marks a World Day of Invocation celebrating the collective aspiration of humanity to act in harmony with its highest spiritual goals. We at SouledOut.org are participating in the World Invocation Day Vigil. Join us in a 15-minute prayer / meditation for a world culture of cooperation, justice and peace on both June 14 and June 15 from 9:00pm-9:15pm PDT (04:00- 04:15 UT 6/15 +16) and also on June 15 from 1:00pm-1:15pm PDT (20:00-20:15 UT). Begin and end by sounding The Great Invocation. What was conceived at the New Moon: Spiritually Infused Leadership in the World (review above) now comes to fruition and is birthed into the full light of our conscious minds. June 14, Tuesday night, the nearly Full Moon activates Antares, the fiery red heart star of Scorpius. The Sagittarian Archer aims his arrow toward the Moon, which is in conjunction with red Antares. This is the first of 3 powerful Goodwill lunar conjunctions. The second occurs with the eclipsed Full Moon at the Galactic Center, the Heart of our Milky Way Galaxy, above the Scorpion's stinger. The third occurs with Pluto, the agent of death, the death of liberation and resurrection. Review map above. Sagittarius sees the vision for humanity and knows the way to go. Scorpius influences a turning point in the life of humanity and in the life of the individual human being. It reorients the personality to the life of the Soul and later to initiation and sensitivity to the Divine Plan. Scorpius is the burning ground and is synonymous with transformation. Antares, associated with awesome power that can be hideous or sublime, wields the Fire of God and gets one's kundalini running! Each year the Goodwill lunar cycle activates the alignment that exists between Aldebaran, the star of illumination in the constellation Taurus, and Antares, the heart star of Scorpius. The New or young Moon lies near Aldebaran, while the Full or nearly Full Moon lies near Antares. Hmmm ... both stars are red in color. The Source of Life and Divine Will are associated with the color red. Directly opposite Antares in the sidereal center of Taurus is Aldebaran, eye of the Bull. The Aldebaran / Antares axis is indicative of political systems, their people, and their opposing politics. Aldebaran holds and radiates vision for ideal physical logistics for authorities to put in place so as to aid the peoples of the Earth through evolutionary process and transition. Antares ensures that the current and accepted approaches and visions do not become static or antiquated. Antares ensures growth, evolution and change. The Goodwill lunar cycle is strongly calling for the re-evaluation, reform and removal of antiquated governing systems and personal habits that no longer nourish the eternal spirit. The emanations of the Aldebaran / Antares Axis are assisting the nations of the world in claiming their true power by meeting the needs of the people. June 15, Wednesday night, Goodwill's eclipsed Full Moon Moon lies above the stinger of Scorpius, in conjunction with the Galactic Center (GC). This is the second of the 3 powerful Goodwill lunar conjunctions: the first with Antares, the third with Pluto. Review map above. The Scorpion’s “rebellious” Antares and stinger make sure the governing vision of humanity is current; they align us with the expansive, inclusive heart of our Milky Way Galaxy. To view an annotated map of the Galactic Center click here. Special blessings pour out of the Galactic Heart for the Earth during this time. These energies draw us toward our spiritual source, stimulating the Principle of Goodwill and humanitys aspiration toward God. These energies support our greater wellbeing and evolutionary fulfillment. They offer us the opportunity to transcend our little selves and manifest our divinity in our everyday world. Note: The Galactic Center is located at 2º sidereal Sagittarius or 27º tropical Sagittarius. Sidereal refers to the constellation and tropical refers to the sign. To understand the difference between the signs and constellations click here. BTW: Our solar system rotates around the Galactic Center. At a distance of 26,000 light-years from the Galactic Center, the Solar System completes a Galactic orbit in about 226 million years. June 16, Thursday, Goodwill's Gibbous Moon conjoins Pluto above the handle of the teapot-shaped asterism of Sagittarius, at 10:23am PDT (17:23 UT). This is the third of 3 powerful Goodwill lunar conjunctions: the first with Antares, the second at the Galactic Center above the Scorpion's stinger. Review the map above. Pluto the agent of death and destruction packs a powerful punch in Sagittarius, where it brings unrelenting transformation to humanity's most basic belief structures. Sagittarius the cosmic Archer along with Pluto are leading humanity beyond its mortal limits toward its spiritual inheritance. They are impressing humanity to aim for the spiritual vision that includes the “Whole” Truth and unites us all. This vision is essential to building our future, claiming our true power and realizing our destiny. The heavenly archer has the ability to evolve the 4th human kingdom into the 5th spiritual kingdom so that all Children of God may celebrate. As we again celebrate the spirit of humanity, dedicate ourselves to right human relations and align with the Will of God, our energies are being expanded to include all of humanity, the solar system, the galaxy and the spiritual kingdom! During the Goodwill Festival of Unification, the Archer, the Scorpion, the Gemini Twins, the cosmic Bull, as well as at the Heart of our Galaxy and Shamballa are all evoking a new humanity. This aspiring humanity will undergo an initiation and evolution of the heart that will lead to a spiritually infused leadership in our world and a true healing of the nations. Free your mind, let go of outdated habits, and open your heart to the outpouring of this Festival's special blessings. Allow the will-to-good to enter your consciousness and affect our world.